Price After $350 Instant Rebate. 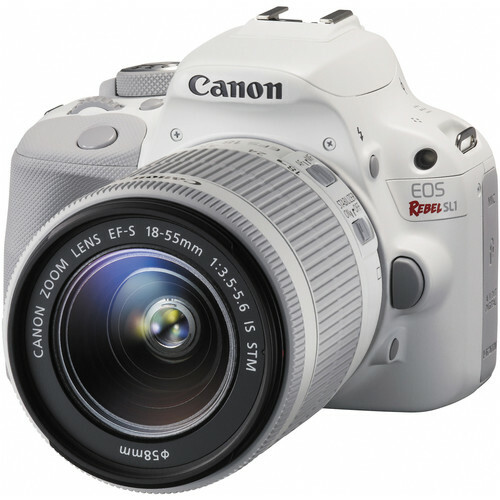 The white EOS Rebel SL1 DSLR Camera with EF-S 18-55mm f/3.5-5.6 IS STM Lens from Canon is a lightweight APS-C format digital SLR camera with an 18MP CMOS sensor and the DIGIC 5 image processor. It is combined with the 18-55mm f/3.5-5.6 lens for an effective range of wide-angle to standard focal length shooting options. The EOS SL1 provides sharp details, accurate colors and low-noise imaging in compact form factor with easy to use interface. A 9-point autofocus system provides fast focusing when shooting with the viewfinder and Hybrid CMOS AF II increases autofocus speed and accuracy when shooting in Live View. The Rebel SL1 can continuously shoot up to 4 fps and its wide ISO range of 100-12800 (expandable to 25600) allows for confident shooting in bright and low light situations. A 3.0" Clear View II touchscreen LCD with 1,040k-dot resolution provides composition and playback viewing. Its intuitive touchscreen operation includes multi-touch operation with direct access to functions for settings changes and Touch Autofocus. Smudge-resistant coating keeps the monitor clear, even in bright sunlight. An optical viewfinder with 0.87x magnification is also available for stable eye-level composition. Full HD 1080p at 30 fps and 24 fps is supported with Movie Servo for continuous autofocus during shooting. Manual exposure is provided in video mode and 60 fps is possible when shooting at 720p HD. A built-in mono microphone with manual audio level adjustment is provided, and Video Snapshot with editing is supported. Scene Intelligent Auto Mode automatically makes the optimal camera adjustments based on scene recognition and improved scene detection is particularly helpful when shooting night scenes. Advanced imaging features such as Effect Shot mode and background Simulation are available and Creative Filters add expressive touches to your images and can even be viewed in real time during Live View shooting. Special Scene Modes including Kids, Food and Candlelight let you set the type of shot you want and have the camera do the rest. The EOS Rebel SL1 is compatible with the full line of Canon EF and EF-S lenses. It is paired here with the EF-S 18-55mm f/3.5-5.6 IS STM lens which offers wide-angle to standard length shooting capability specifically designed for APS-C cameras. It is equivalent to a 28.8-88mm focal length in the 35mm format and its minimum focus distance is 9.8". This lens features Canon's Optical Image Stabilization system, providing 4-stops of compensation against the blur caused by slow shutter speeds when shooting hand-held in low light or at longer focal lengths. An internal focusing system provides fast autofocus and with a Stepping Motor (STM) and six group zoom system it supports the Rebel SL1's Movie Servo AF feature for smooth and quiet continuous autofocus during video recording. Manual focus override is possible. A high precision aspherical lens reduces chromatic aberration throughout the zoom range for sharp imaging and Canon lens coatings provide accurate color balance and minimal ghosting and flare. 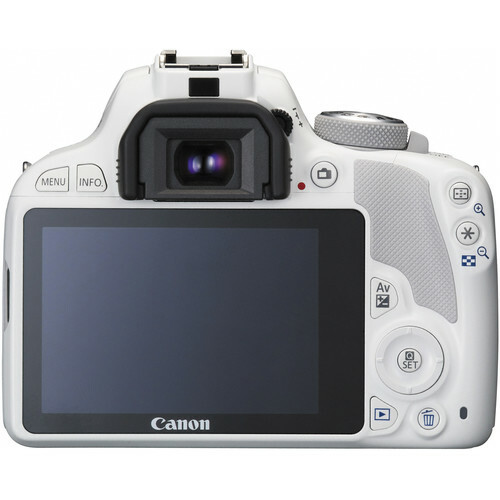 18MP CMOS Sensor and DIGIC 5 Image Processor High resolution, low-noise imaging and fast performance speed, including 4 fps continuous shooting, is provided by the combination of the Canon DIGIC 5 Image Processor and 18MP CMOS sensor. 3.0" Clear View II Touchscreen LCD Monitor A 3.0" Clear View II Touchscreen LCD monitor with 1,040k-dot resolution provides clear composition and playback viewing even in bright light. Its smudge-resistant coating keeps the monitor clear. The touchscreen features multi-touch operation with direct access to functions for setting changes and provides Touch Autofocus. Seven brightness levels are available for better viewing depending on lighting conditions. Full HD 1080 Video Capture Full HD Movie mode supports Movie Servo for continuous focus tracking of moving subjects during recording. When shooting video with one of Canon's STM lenses, Movie Servo AF takes advantage of the lens' stepping motor (STM) for smooth and quiet continuous autofocus. Manual exposure settings provide complete control over your shooting, and multiple frame rates and resolutions provide quality-level and stylistic shooting options. The ISO range in Video mode is 100-6400, and is expandable to 12800. Stills can be recorded during video shooting simply by pressing the camera's shutter button. The in-camera microphone records in mono however an external stereo microphone jack is also available. Compact Form Factor The Rebel SL1 is a particularly compact and lightweight DSLR, weighing approximately 13 oz. EF-S 18-55mm f/3.5-5.6 IS STM Lens The EF-S 18-55mm f/3.5-5.6 IS STM lens offers wide-angle to standard length shooting capability specifically designed for APS-C cameras. It is equivalent to a 28.8-88mm focal length in the 35mm format and its minimum focus distance is 9.8". This lens features Canon's Optical Image Stabilization system, providing 4-stops of compensation against the blur caused by slow shutter speeds when shooting hand-held in low light or at longer focal lengths. An internal focusing system provides fast autofocus and with a Stepping Motor (STM) and six group zoom system it supports the Rebel SL1's Movie Servo AF feature for smooth and quiet continuous autofocus during video recording. Manual focus override is possible. A high precision aspherical lens reduces chromatic aberration throughout the zoom range for sharp imaging and Canon lens coatings provide accurate color balance and minimal ghosting and flare. 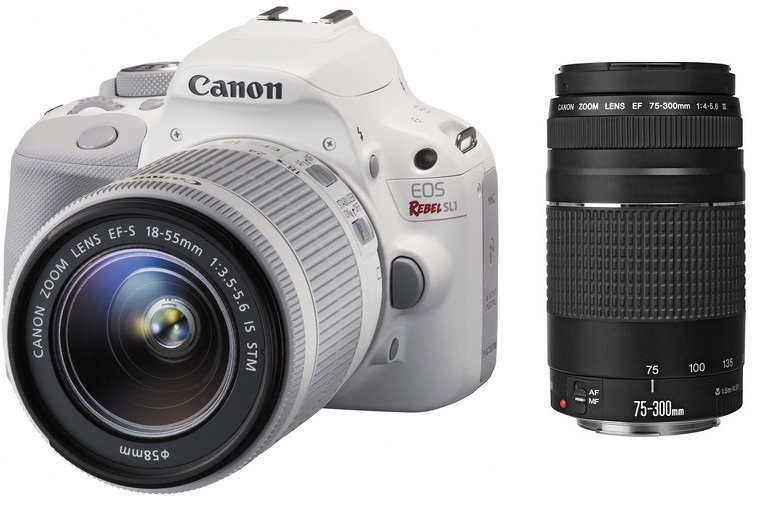 Lens Compatibility The Canon Rebel SL1 is compatible with all EF and EF-S lenses. 9-point Autofocus System A 9-point AF system (including a high-precision dual-cross center point) provides fast and accurate autofocus performance when shooting with the viewfinder. The Center AF point is AF cross-type at f/5.6, Center AF point is vertical line-sensitive at f/2.8. Hybrid CMOS AF II The Hybrid CMOS AF System is utilized when shooting photos and video in Live View. Combining two different kinds of AF-phase and contrast detection-continuous focus tracking becomes faster and more accurate than ever before in Live View. Hybrid CMOS AF II boasts an increased AF area (compared to Hybrid CMOS AF) that covers approximately 80% of the sensor for easier composition. ISO Range An ISO Range of 100-12800 (expandable to 25600) provides low-noise capture in low light situations and saturated colors in bright conditions. Â Price After 100 Instant Rebate. 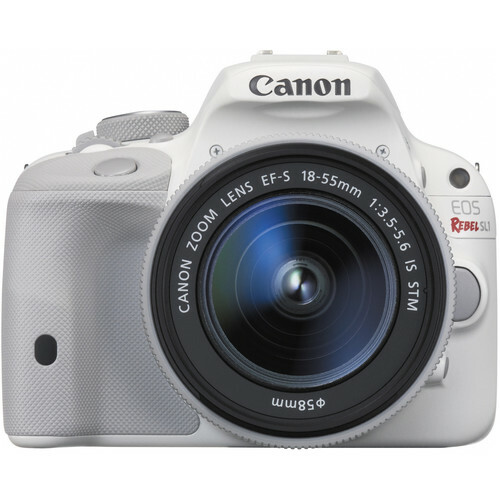 Original Price $749.00 The white EOS Rebel SL1 DSLR Camera with EF-S 18-55mm f/3.5-5.6 IS STM Lens from Canon is a lightweight APS-C format digital SLR camera with an 18MP CMOS sensor and the DIGIC 5 image processor. It is combined with the 18-55mm f/3.5-5.6 lens for an effective range of wide-angle to standard focal length shooting options.